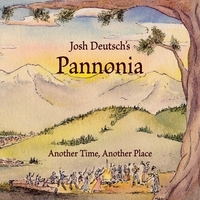 "You’ve got to love an album of “traditional folk music from an imaginary place,” which is what Josh Deutsch’s Pannonia delivers on Another Time, Another Place. This well-planned, beautifully executed program draws on influences from practically everywhere. Deutsch seems to be obsessive on details, and he’s hell-bent on making music that’s just a little (or perhaps a lot) different than what you’ve heard before. Deutsch has written a set of 10 songs that seem to serve as the soundtrack to a movie script yet to be written. And he starts with excellent source material. Prior to recording the album, Deutsch had gone back and reread one of his favorite books, Tom Robbins’ 1984 novel Jitterbug Perfume. Five of the tunes on this recording were inspired by the book, including the driving “Bingo’s Bees” and the intensely beautiful “K23.” In creating this world, Deutsch shows incredible humor, too, especially on “Serious Beets,” a tune he calls the Pannonian drinking song. The song is a hoot, with bassist Gary Wang bowing as if he were stumbling down a Pannonian boulevard. Of the other five tunes, two are part of what Deutsch calls an “unusual modes of transportation suite.” “Dirigible” and “Funicular” are both terrific. The other three tunes provide great opportunities for the band to stretch out. My favorite of these is “Kék Szín,” which is Hungarian for “blues.” It’s a great, toe-tapping wonder of Eastern European soul that highlights this fascinating band—Deutsch on trumpet, Zach Brock on violin, Brian Drye on trombone, Wang on bass and Ronen Itzik playing ridiculously fine percussion. Even here, Deutsch and company prove to be fantastic storytellers. The solos are superb, and Deutsch makes great use of off-mic instruments soloing, almost as if to offer the audience a stage whisper about what’s happening in the studio. Odd meters, unusual instrumentation, deep compositions, a clearly drawn fantasy world: That’s Pannonia. That’s Josh Deutsch." A native of Seattle, Deutsch started playing piano and composing music at the age of five before discovering an affinity for the trumpet as a member of award-winning jazz bands at Washington Middle School and Garfield High School. He received a Bachelor's Degree in Jazz Studies from the New England Conservatory of Music in Boston, where he studied with Danilo Pérez, Bob Brookmeyer, John McNeil, Allan Chase and composer Lee Hyla. A three-time participant at the Banff International Jazz Workshop, Deutsch worked closely there with Bill Frisell, Dave Douglas and Kenny Werner among others. In 2006, he was awarded a Graduate Teaching Fellowship from the University of Oregon from which he received a Masters of Music in Jazz Performance and Composition in 2009. He won the Reno International Jazz Festival’s Outstanding College Trumpeter award in 2008 and 2009 and is also a winner of a Downbeat Student Music Award as a College Jazz Soloist in 2008.